You can find us at one of our specialist vestibular rehabilitation clinics. 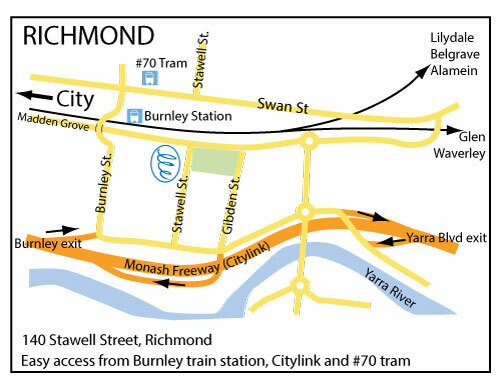 Richmond is our main location and is convenient by car, train and tram. We also run a clinic at the Royal Victorian Eye and Ear Hospital in East Melbourne. So choose the location that is most convenient for you and then make contact with us to arrange an appointment. This is our main treatment location with three consultation areas, an equipped gym, two vestibular treatment beds and a large waiting room. The Clinic is opposite a small park and there is usually some parking available nearby. 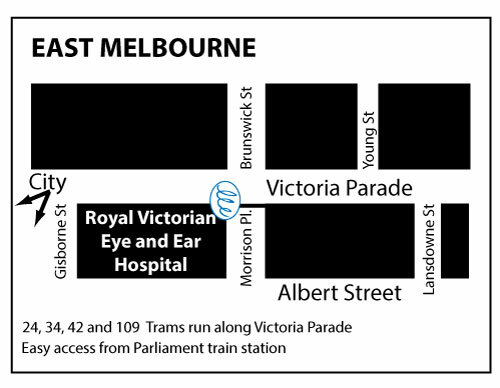 We also operate a private clinic at the Royal Victorian Eye and Ear Hospital on Victoria Parade in East Melbourne. Parking can be a challenge near the hospital, but if you are coming by taxi or if someone can drop you off, then there is a convenient drop-off point in Morrison Place, which you access from Albert Street. If you are going to park, then this is possible on Albert Street, or one of the streets nearby. Most parking spots in the city are metered, so make sure you have a two hour spot to avoid any stress during your appointment. Alternatively the hospital is well serviced by trams (11, 24, 30, 42, 109, 112) which all stop right outside the hospital on Victoria Parade. The nearest train station is Parliament Station on the City Loop, which is an easy 10 minute walk from the hospital. When you get to the hospital, you will need to take the lift to the second floor (sign-posted audiology). The reception desk is very close by and if you let the lovely team at reception know that you have arrived, then you can take a seat in the waiting area.